Hey everyone, I’ve been playing Lords Mobile since it basically came out. I fell in love with the game pretty quickly even though I didn’t think I would and I’ve been playing ever since. Gathering is the thing I always do when I’m not in my war specialization/talents. It is one of the main reasons I grew so quickly in this game. I am very low spender in this game so I can relate to the majority of you and the struggles of playing against all of these pay to win players. I’d like to tell all of you what I know on the gathering aspect of this game and how you can do it to the fullest capabilities. There are five resources in this game going in descending order from the top of your resources in the top right of your screen they are: food, stone, wood, ore, and gold. 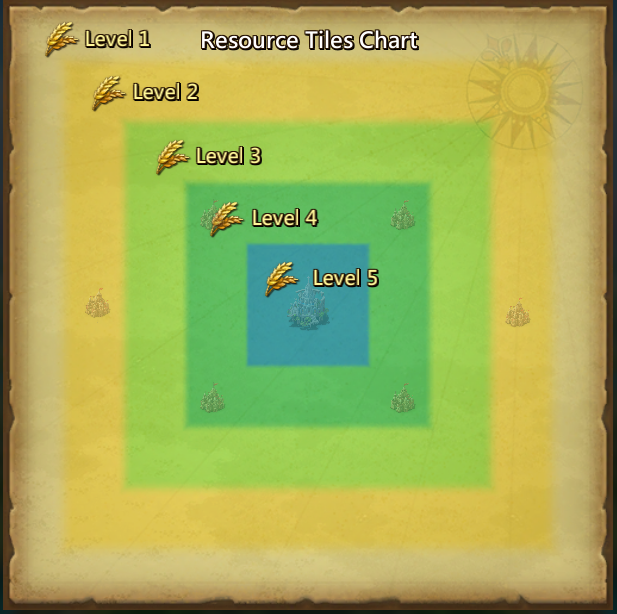 These are the five resource tiles in the game and what resource they yield. The rarest tiles to find are Ruins tiles which yield gold which is the most important resource in this game. While the easiest tiles to find are Field tiles which yield food. The reason they are so easy to find is because most players in this game don’t make more than one Farm due to troops not being able to die from starvation. Once you tap on the tile it’ll give you the option to gather it. You’ll come to a screen where you will send troops to the tile. Troops have a carry weight capacity. This stat can be viewed on each troop type in the barracks screen. The siege troop type has the highest capacity out of all types of troops. A tier 3 Fire Trebuchet has a capacity of 15, which means that one Fire Trebuchet can carry 15 of a resource. I’ll go farther into capacity and which troops you should use in another section. When the time has elapsed and your troops have returned from the tile you were gathering from the resources you were gathering will be given to you. However there is a chance that you will also be given a material or materials of many qualities. I will go into material rewards from gathering in a separate section in this guide. Every tile has a level. The levels range from 1-5. The higher level the tile, the more a tile will yield before it depletes and the higher grade material it could possibly give. Different level tiles can be found at different parts of the map. This map is available in the bottom left of your screen in-game along with the kingdom map. The map to the right here is what you’ll find. Level 1 tiles are on the outskirts of the map. Level 5 tiles are available around the base. As you can imagine, higher level tiles are more valuable than lower level tiles. The easiest place to gather while getting better tiles is the level 3 zone. Many also prefer the zone between 2 and 3 because you get access to both, especially if you’re going for Ruins tiles. Level 1 Tiles can give common materials. Level 2 Tiles can give common-uncommon materials. Level 3 Tiles can give common-rare materials. Level 4 Tiles can give common-epic materials. Level 5 Tiles can give common-legendary materials. While the chance of getting a material higher than common or uncommon is extremely rare, there is still a chance. I regularly farm the level 3-4 tile category because there is a chance of getting rare and epic materials but I get several materials that are common or uncommon per tile. Those materials add up quickly if you gather very often. You can figure out which materials you can get from a tile by tapping a tile and then tapping the “i” button in the right side of the screen. However, I will list out each tiles materials right here. Ruins do not give any materials. They are strictly for gathering gold. If you gather for one reason only, you should gather for the fact that you will get more materials to upgrade and build equipment. Not to mention the passive bonus of constantly getting resources. There’s 2 stats that matter when it comes to gathering: Gathering Speed and Army Capacity. Army Capacity: This stat makes each troop able to carry more resource per person. Army Capacity is a stat that will not matter the more you progress and the bigger your army is, unless you really care about sending the least amount of troops possible to a tile. How do you get these boosts? There’s several ways to obtain boosts like this. First, there’s talents. For Army Capacity there is 2 separate talents on the right side of the talent tree: Max Load I and Max Load II. These 2 talents at max can give a maximum of 117% bonus to your troops capacity. For Gathering Speed there are also 2 separate talents on the right side of the talent tree: Gathering I and Gathering II. These at max can give a maximum of 117% bonus to gathering speed. You want to max the second talent of each first. It’ll give you the best bonus overall if you can continue to put points into them. I highly suggest maxing gathering speed before max load. You can also receive Gathering Speed boosts from buying them in both the Gem Shop and the Guild Shop. It’s under the speedup category all the way at the bottom. They are 50% gather speed boosts. These are NOT applicable to Gem Lodes. In my opinion, if you can buy something for guild coins and not use gems, always do that. You can buy a 24 hour one which costs 30,000 guild coins (600 gems). You can also buy a 7 day one for 127,500 guild coins (3,360 gems). In my opinion the 7 day gather speed for guild coins should always be bought if you plan on gathering for a while. It’s a huge help. I am going to list the best gathering equipment for speed and then add in a couple army capacity pieces you can swap out as needed. If you’re curious or looking to see what the max speed boost is: I’ve found that the maximum you can get is 332% Gather Speed increase. There are unspoken rules in this game that everyone seems to know about. You should really follow these rules unless you want to be attacked or hated. Rule 1: Whoever starts going to the tile FIRST has the right to get the tile. If you go to a tile someone is already going to and you do not pull back, they have every right to burn you to the ground. Rule 2: Check the rules in your kingdom for level 5 tiles. Most kingdoms reserve all level 5 tiles to the overlords and taking them is a death sentence for you and your guild. -Pay attention to your cargo ship! You can put all those resources you’ve gathered directly into your bag and sometimes even more. Bryng - IGG ID: 331014955. Hi, thank you for your nice guide. We'll feature it in our event post and send you 20K gems in 24 hours! Awesome! Thanks! I have not received the gems yet though. Thanks Bryng. Great guide but using a 50% gathering speed boost doesnt not cut time in half. It reduces your time by a third. I think that when you mention the lvl of tiles and writing article like that you have to feel the timing for each lvl of tile and kind, because there is a difference . Other ways it is good thanx. Thank you for the beautiful guide my sir! Even though I knew most of the stuff in the guide, I am sure that it will help others tremendously! In regards to increasing the chance that a material will drop, Is it better to do short quick trips to a tile? For example, I can send 100 troops 10 times or 1500 troops once in about the same period of time. Which would yield more materials dropping? Amazing guide! This will be great for beginners and farms you even included gear with gathering boosts. Thank you So much for this! Ive noticed that when gathering level 5 some go gaster than others. Does troop type matter? Or is the type of rss you are gathering? Gathering a level 5 field is 4m rss bit goes faster than ore. Any help there?